A crew neck is a type of t-shirt that has a round neckline and no collar. It is sometimes references as a round neck tee. The neckline is the top edge of a garment that surrounds the neck. The terminology is generally in regard to the front view. A crew neck happens to be round shaped in both the front and the back. However, when discussing a v-neck (different type of neckline) it is actually a "v" in the front but the back is still rounded. Again, the neckline typically represents the front view (but not always). The T-shirt crew neck was developed in 1932 as an undergarment that would absorb sweat and prevent shoulder pads of American football players from causing chafing. The U.S. Navy was the first of the U.S. armed forces to adopt the crew-neck T-shirt or "Gob Shirt". In modern times, this style of top is extremely popular and part of the wardrobe of most women. 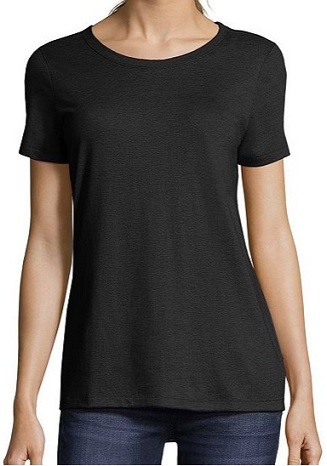 This style of neckline can be on short sleeve or long sleeve tees. Variations of the word: crewneck, crew neck, crew-neck. Apparel Search is a leading guide to fashion, style, clothing, glam and all things relevant to apparel. 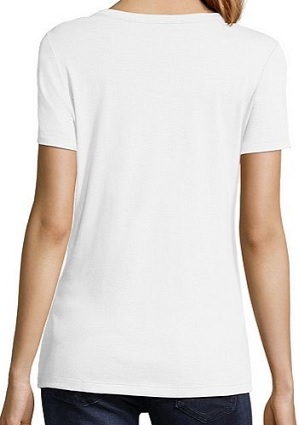 We hope that you find this ladies crewneck t-shirt page to be helpful. You may find the following pages to be of interest as well. What ever style of top you are wearing today is in fashion. If you want to be even more stylish, you should wear your favorite tee today.